This is one of those interesting product reviews that really makes it worth doing this sometimes. It’s not often I get a chance to review something as obscure as nail clippers. So anyway, I got my Klhip in the mail and the first thing that struck me was its fabulous design. We’re calling it our ‘space-aged nail clippers’. The look of it is a welcome redesign of the classic nail clippers we’ve all become so used to. Ok, so never having reviewed nail clippers before I was very glad to see the press kit in the package as well that described for me what makes the new design so much better. So I’m going to go through the different speaking points from the press kit and see how Klhip performs. Superior cutting action: A reversed lever and falling-rate cam make cutting thick nails easy and normal nails effortless. I started out on my thumbnails which aren’t really what could be considered as thick, but they’re quite healthy. And I will say that the Klhip performed very well. They’re very sharp and didn’t make that familiar clicking sound that normal clippers make when they finally get through the nail. The action was very smooth, and the jaws of the Klhip just went through the nail with no trouble. So I’ll definitely say it was effortless on my thumbnails. And it took me a while but I found someone with really thick toenails who agreed to let me Klhip them. And no, I wasn’t out at the mall asking people to see their feet. I ended up with a friend of a friend. For this experiment, I clipped the first nail with my favorite clippers, and then the other nail with the Klhip. And I never really thought about it before because I just don’t clip nails that much, but they’re absolutely right. The cutting action was very smooth and there’s a huge difference between the Klhip and classic clippers. Better ergonomics: With its reversed lever, the user applies pressure directly over the nail. This creates a natural and more comfortable grip and makes clipping easy. I’ve never really thought about it before, but the classic clippers really are kind of hard to hold. The lever sits up so high and you have to really stretch your thumb out on the larger clippers, and since it swivels, you have to make sure it doesn’t swivel out from under you while you’re cutting something thick. I was really impressed with the Klhip and the reversed lever doesn’t swivel around like the classic clippers so there’s no sliding out from under you. Also, the lever actually does put pressure directly over the nail, which allows the lever to be lower so it’s less of a stretch for your thumb, and you can even clip a nail on the same hand you’re holding the clippers with. Smooth, single-blade cutting: Double blades either dull each other or tear the nail. Klhip’s sharpened upper blade cuts so cleanly and precisely that filing isn’t necessary. The smooth action tends to keep clippings on-board instead of falling to the floor. This really is a very clean cut. The first couple times I used it on my fingernails they honestly felt a little weird because I wasn’t used to them being cut so cleanly. It left them rather sharp actually, but not in a bad way. However, for me at least, I’m going to have to disagree that you don’t need to file your nails after using the Klhip. I found that even though the cutting action is very smooth, and the blade is very sharp, that doesn’t change the fact that as you go around the nail, you have to reposition the clippers. This leaves very tiny corners on your nail. And while they’re small, if you saw them under a magnifying glass your nail would look kind of like a stop sign. So no matter how sharp the clippers are, I find I always need to file those little corners off. And for this reason I’m going to have to put the lack of a built-in file as a ding against the Klhip. Sleek design, quality materials: Clean lines make Klhip easy on the eyes and surgical stainless steel holds up for a lifetime of use. I’ve already talked about how cool the new design is so there’s no need for me to elaborate on it anymore. And the Klhip does seem very sturdy. 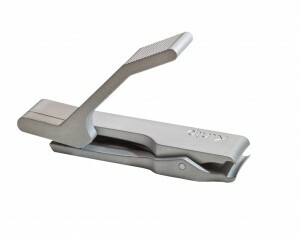 The Klhip is a radical new design on the classic nail clippers. And while it wouldn’t have crossed my mind to re-design nail clippers, I’m glad someone is out there thinking about things like this. It has a sturdy design and is the cleanest, sharpest cut I’ve ever experienced. Its ergonomic design can save you some straining when doing a lot of cutting especially on thicker nails. I find its lack of a built-in nail file to leave me wanting one, and I personally didn’t think it did as good of a job on cat claws as the classic design does. The missing nail file also leaves me without anything to dig dirt out from under my nails. I typically reach for my clippers when I get something under my nails, so what do I reach for now? I have to buy and keep a separate nail file handy for these tasks. The pricetag may leave the bulk of the home users out in the cold at about $75, but professionals will find this indispensible. And I really do think this is where the Klhip will find its home. Because home users don’t clip nails all day, so the sleekness of design to save your strength while cutting isn’t that big of a deal to us. Professionals however, do that all the time and it does matter to them.